These are answers to some questions I get asked a lot. 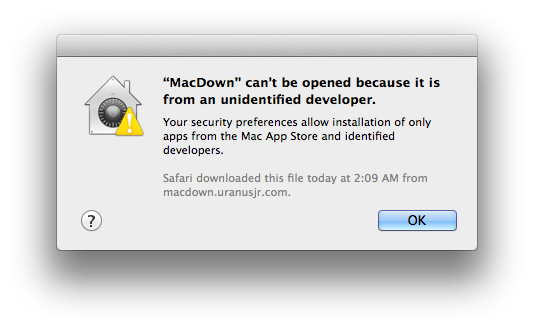 macOS Says You Are an Unidentified Developer! Click “Open Anyway” to authorise MacDown, or select the “Anywhere” radio button to allow all unidentified apps (including MacDown) to open in the future. You may need to click at the lock in the bottom left and enter your password first. Will You Support Other Platforms? I did have plans to build some kind of ports. Most of MacDown’s core functionalities are based on C libraries (except autocomplete), so it won’t be hard to replicate something similar with other GUI frameworks. I don’t currently have the time, but I’ll be more than happy to share the details if you are interested. How About macOS Versions Earlier Than 10.8? The main problem here is that I don’t have enough resources to promise API compatibility without seriously slowing down development. Unless I build some kind of CI services, backward compatibility is easier said than done. One possibility here, however, is to provide support via a cross-platform port (see previous question). As far as I know, most cross-platform GUI frameworks support all the way back to 10.6, so this could be a stone that kills two birds. If someone does that. GFM (GitHub Flavoured Markdown) is a mix of standard Markdown, and some non-standard syntaxes that add additional functionalities and/or more ease for a particular group of people to write. MacDown provides lots of switches to let you choose what non-standard syntax(es) you want to use, and you can get almost all features in GFM if you configure them correctly. Check out the Features page to find out what extensions MacDown provides. And “Task list syntax” in the Rendering preference pane. Will There Be a VIM Mode? No. VIM edit mode is a topic too big. I leveraged a lot on macOS’s built-in text editing functionalities when implementing the editor, and implementing VIM mode means that I’ll need to tear them all down and start from the ground up. This doesn’t fit well with the direction of the project. There are several VIM plugins that can achieve similar things, just search for vim markdown preview in your search engine. Or I would recommend Sublime Text instead if you really want something more GUI. Enabling extensions like Vintage, Markdown Extended (or MarkdownEditing or others, pick what suits you), and Markdown Preview should be enough. I Have a Question/Problem/Suggestion. Where Should I Post It? You can report any issues you encountered with MacDown at the project’s GitHub issue page. Suggestions are also welcomed. If it is about this site, not MacDown itself, you can report them here instead. Please feel free to offer any advices, or send me a pull request with your implementation. 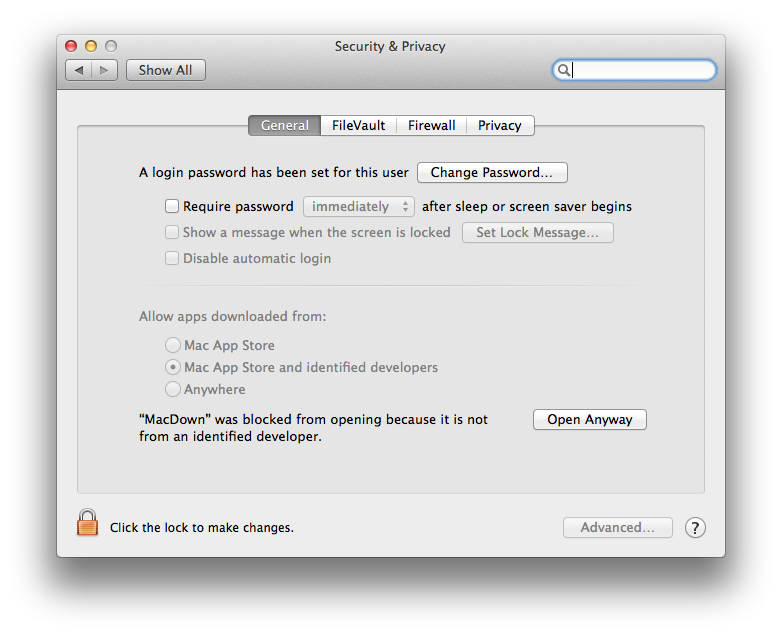 There’s one exception to this: MacDown does not accept new code block syntax highlighting rules. Refer to the relevant section for more information. Why Didn’t You Use Swift? MacDown was initiated shortly after Apple announced Swift. While Swift is truely a nice language, I do not think it is quite production-ready yet. I would very much like to use it in the future, though. Use the form below to tip me through Paypal. You can also fill in the text box if you want me to say something on Twitter about it. Please understand that this is purely a tipping option. I thank you for your kindness, but will not provide anything of any form whatsoever in return for the donation. Oh, and if you perfer to buy me a drink personally, just send me a tweet when you visit Taipei, Taiwan, where I live. I look forward to meeting you! …or with Homebrew Cask: brew cask install macdown. Copyright © 2014–2018 Tzu-ping Chung. Icon design by Matt Zanchelli. Built with Lektor, Foundation, and ❤️.